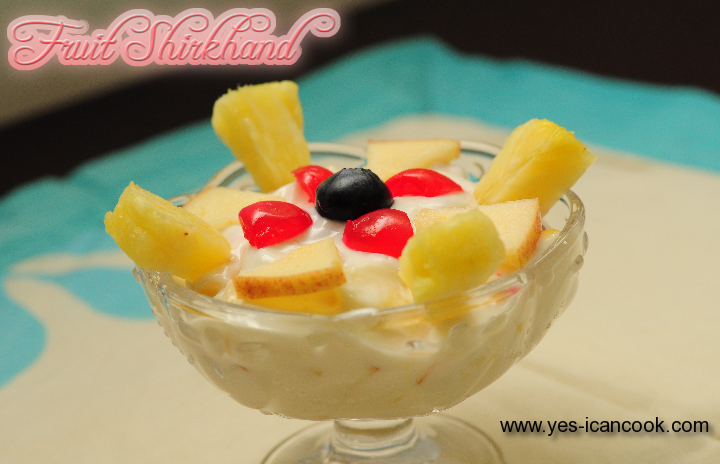 Shirkhand is an Indian sweet made using Strained yogurt and sugar. It is flavored with cardamom, saffron and served as is or is blended with fruit pieces, fruit pulps, dried fruits, nuts, syrups etc. I came across this recipe for Fruit Shirkhand on the facebook page of a friend that I follow. She is an amazing person, a great cook and a food lover. She posts her own recipes and interesting recipes prepared by others. She also posts my recipes. The original recipe calls for hung curd. Hung curd is prepared by straining yogurt in a muslin cloth for several hours. I had read long time back that Labneh also known as strained curd or greek yogurt is actually hung curd. Since then I use Labneh as a direct substitute to any recipe that calls for Hung Curd. So I used labneh to prepare the shirkhand and it was yummylicious. 1. In a bowl add the labneh. 2. Add sugar and mix it with a spoon or whisk it using a wire whisk till it turns creamy and smooth and the sugar dissolves. 3. Cut one apple slice into small pieces with or without the peal as desired. 4. Cut one pineapple ring into small pieces. 5. Cut 2 of the glazed cherries into small pieces. 6. 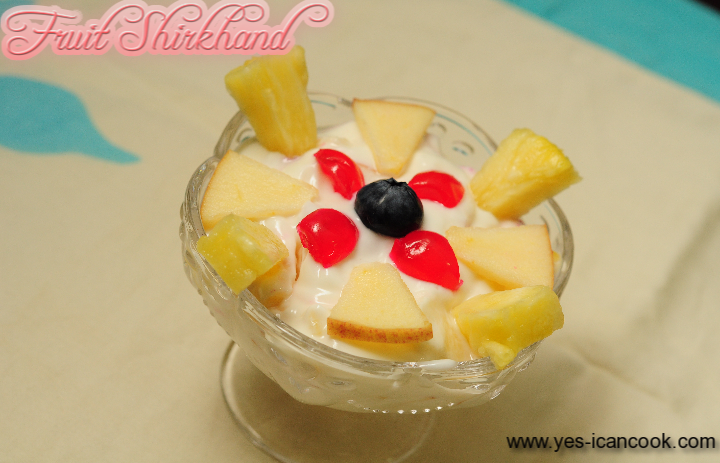 Add the apple pieces, pineapple pieces, 5 blueberries and the cherry pieces to the shirkhand and mix well. 7. Digg in and enjoy or transfer to a serving bowl. 8. Cut the second apple slice, pineapple ring, cherry into wedges and decorate or top up as desired. Thanks a lot Priya. Appreciate your comments. I will definitely take a look asap. Did you manage to make it?